Birmingham Conservatoire students are to perform at a memorial concert celebrating the life of Sir Nicholas Winton, the British humanitarian who organized the rescue of children from Nazi-occupied Czechoslovakia on the eve of the Second World War. In an operation known as the Czech ‘Kindertransport’, Sir Nicholas arranged for the safe passage and rehoming of 669 children to Great Britain, most of them Jewish. 24 cellists from Birmingham Conservatoire, collectively known as CELLOSOUNDBIRMINGHAM, will perform at ‘Sir Nicholas Winton – A Celebration’ on Friday 20 May at St John’s Smith Square in London. South African soprano Caroline Modiba, who is also studying at Birmingham Conservatoire – part of Birmingham City University – will be performing too. Caroline is studying for her Advanced Postgraduate Diploma in Music and will be singing ‘Bachianas Brasileiras No. 5’ by Hector Villa-Lobos. It is an honour to pay respect to Sir Nicholas Winton as he was a great man, and it will be great meeting the children he saved from Czechoslovakia and hearing their stories. The concert, organised by military veteran charity Glen Art, will see all proceeds donated to Syrian children refugee charities Refugee Council and Theirworld. Sir Nicholas died last year, aged 106, on the anniversary of the departure of a train in 1939 that was carrying the largest number of children – 241. It is estimated that around 6,000 descendants from the 669 owe their lives to the ‘British Schindler’. A number of descendants of those saved will be paying tribute at the event and present will be American paediatric geneticist Professor Renata Laxova, who came to Great Britain on Sir Nicholas’ ‘Kindertransport’. Professor Laxova's daughter went to school with world famous cellist and International Chair in Cello at Birmingham Conservatoire, Alexander Baillie. Alexander will direct the upcoming memorial concert and, along with Birmingham Conservatoire students, Marianne Olyver and Nigel Yandell will perform their ‘Postcards from Europe’ programme on violin and piano. "We are incredibly grateful to Alexander Baillie for bringing these young artists from Birmingham Conservatoire to St John's Smith Square to celebrate Sir Nicholas Winton's life, raise funds for the Syrian Refugee Children whose need is so great, and perhaps carry a little of Sir Nicholas Winton's ethos into their own lives." "Sir Nicholas had a motto, that 'if something isn't actually impossible, there must be a way of doing it!'" The concert will feature readings from Hollywood actors Jason Isaacs and Rupert Graves – the latter who portrayed Sir Nicholas in the 1999 drama 'All My Loved Ones'. "Never has the word memorial been so apt. 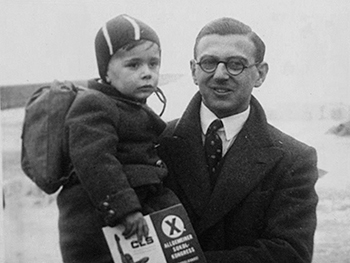 We’re remembering not only the selfless and noble actions of Nicholas Winton on 20 May, but his story urges us to remember that we can all always do something to fight injustice, however powerless we might feel. It’s going to be an inspiring night." "While the world has moved on in many positive ways since Sir Nicholas was moved to carry out his supremely humanitarian act, conflict is sadly still with us. By celebrating his life and selfless feat we hope to bring comfort to those affected, through no fault of their own, by current troubles."